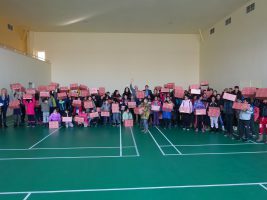 For the ninth consecutive year, the employees of AES Bulgaria have made the children from socially disadvantaged families in Galabovo happy with warm clothes and shoes. On the eve of the brightest Christian holiday – Christmas, the Managing Director of AES Bulgaria Ivan Tzankov and the Plant Manager of AES Bulgaria Todor Belezhkov gave presents to the children within the company’s traditional initiative Angels’ Tree. The initiative, funded by the company employees, aims to support children from low-income families by providing them with the necessary winter jackets and boots. With the help of the municipality of Galabovo, AES Bulgaria collects data for children in need in the age group 1st – 7th grade and after consulting with their teachers, determines the needs of each child. Once the information for the required number of jackets and boots is available, the company employees raise funds by participating in a charity raffle. 165 children will be supported by the charity Angels’ Tree initiative in 2018. ‘The care for the communities we operate in is among the priorities of our Corporate Social Responsibility program. It is a great pleasure and pride for me that for the ninth year in a row, the employees of AES Bulgaria have shown their commitment to the needs of the children and donate for the campaign’, Ivan Tzankov noted.